All your existing teeth, checking for mobile teeth as these may have to be removed prior to having new dentures. Looking at existing restorations, fillings, crowns etc. The health of your gums, to make sure there is no infection present. The way the teeth bite together. If you have no natural teeth, accessing your gums and underlying bone. The procedure will be explained to you and a treatment plan given stating all the stages and the costing. Generally, from 2 up to 4 appointments will be necessary as dentures are made in stages. The stages are the same whether you are having Full dentures or Partial dentures. The only exception being an 'Immediate denture', when a tooth is extracted and the denture is fitted immediately to replace the missing tooth. This denture will then have to be adjusted or replaced in 3 to 6 months after the extraction. Impressions (moulds) will be taken of both your upper and lower teeth. These are then sent to the dental laboratory where the technician will fabricate a 'special' tray designed to fit your mouth perfectly and a wax bite block to record the way your teeth bite together. Impressions (moulds) will again be taken, using the 'special tray' which the technician has made, this helps to achieve a more accurate mould of your teeth and gums. A registration of how your teeth bite together will be recorded using the wax bite block. Both the impression and wax block are sent to the laboratory where our technician will construct a trial denture. The shade of the teeth will also be taken at this stage. The teeth are now set in wax, for Cobalt Chrome dentures the metal frame work is completed and the teeth are attached to the frame work with wax. 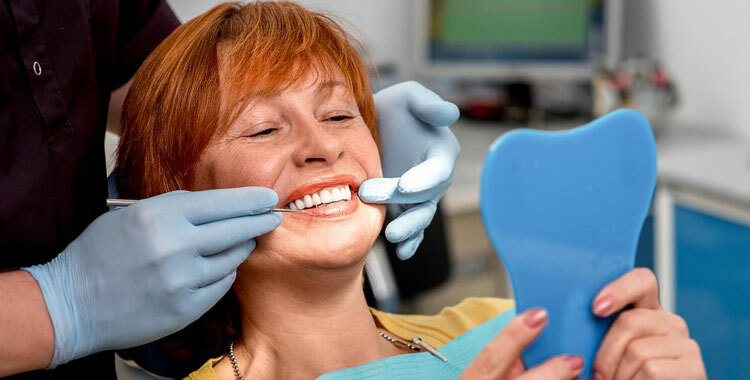 You dentures will be tried in to ensure that it fits correctly, is comfortable and the teeth bite together correctly, any adjustments will be made at this stage. Your dentures are again returned to the Laboratory for the final stage of completion. your dentures will be fitted. It will take a while getting used to new dentures, time and patience is needed. Upper dentures my affect your speech for a few days whilst your tongue gets used to having the denture in place, please persevere as this will soon pass. Dentures may cause soreness in the first 24 hours, if the soreness persists please contact your dentist as the dentures may need slight adjustments, this can be done at the surgery. Keeping your dentures clean at all times is important. Rinse them after meals if possible and brush them twice a day using toothpaste or soap and water. Dentures are only to be worn whilst you are awake; they need to be removed at night as your gums need to have 'a rest', having this rest keeps your gums healthy. Your dentures can then be sterilised in a denture solution while you sleep, always rinse or brush your dentures before putting them back in your mouth. If your dentures get stains that you cannot remove ask your dentist to clean the professionally at your next appointment. It is important that you still have regular examinations with your dentist even if you have no natural teeth, as the dentist needs to look for changes in your gums and the underlying bone. Also to check your tongue, throat, cheeks & lips for infection or signs of oral cancer. "Any surgical or invasive procedure carries risks. Before proceeding, you should seek a second opinion from an appropriately qualified health practitioner."